The Revlon Style & Dry Manicure Set provides all the essentials and more for an at-home nail salon experience. Included is the revlon Extra Life No Chip Top Coat for fast-frying, smooth and glossy nails for that salon finish. Included are 13 attachments with various accessories to create the style you desire. 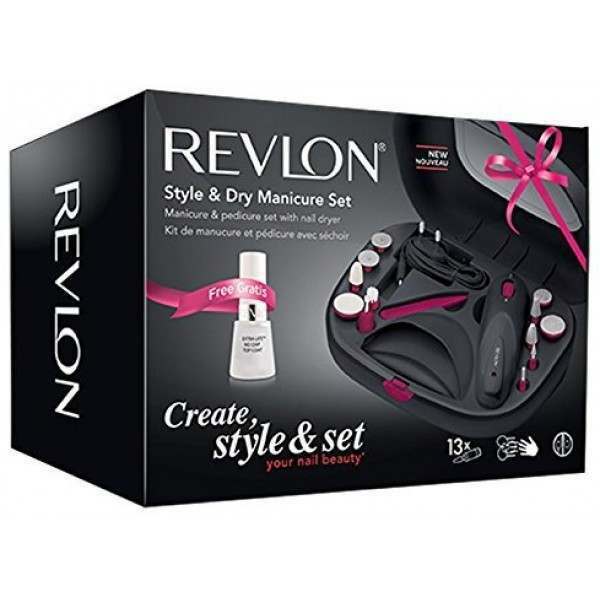 The Revlon Style & Dry Manicure Set has everything you need for an at-home salon experience for your nails. Enjoy chip-free nails for longer by regularly taking care of them with this manicure set. A complete set for the perfect manicure and pedicure, including the Revlon Extra Life No Chip Top Coat; instantly dries wet nail enamel for a high gloss and flawless finish. Mineral oil wraps nails in a smooth, glossy layer for a salon finish at home. Contains vitamins C & E to provide antioxidant protection. A rechargeable manicure pen to allow you to work cordless for extra convenience, with up to 2 hours of cordless use to perfect your beautiful nails. The ergonomic design makes it comfortable to use when working on your own nails, or if helping a friend out. An integrated nail dryer blows cool air to dry the nails quickly for an efficient treatment. 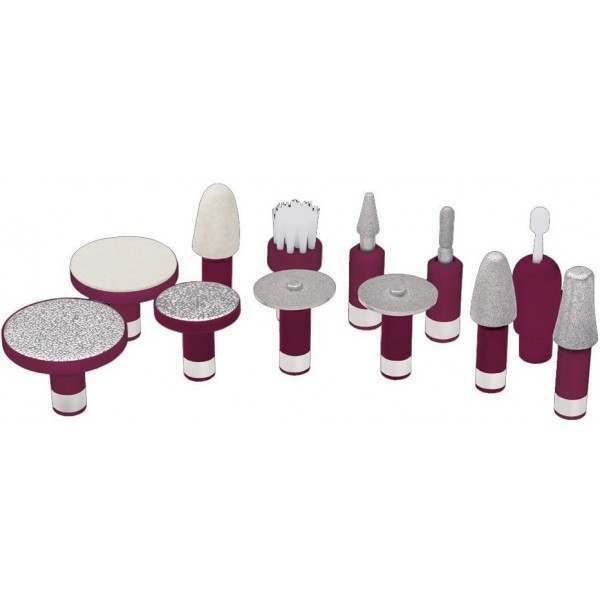 13 attachments are included to tailor your nail treatment to suit exactly what you want: 2 small Fine Shaping discs, Medium Shaping disc, Large Coarse Shaping disc, Filing Cone, Rough Skin Remover, Thin Pointed Stone, Thin Rounded Stone, Polishing Cone, Cuticle Lifter, Hand Held Cuticle Stick & a Cleaning Brush. Travelling? The Revlon Travel Chic Manicure Set is a compact alternative to the Style & Dry, boasting an array of nails tools and accessories to get the same results on your holiday. It's good overall, comes handy if you need to trim long nails, also it's very good for pedicure. Drying is very noisy, though. And my previous kit was more powerful, this one will stop from time to time when pressed to a nail.